Tofu. Is your mouth watering? No??? Well, take another look at this pic above..how about now. 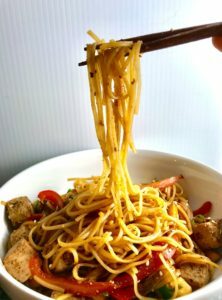 Oh yeah, oh yeah, this Ginger Teriyaki Tofu Noodle recipe is A-M-A-Z-I-N-G. It has a ginger, sesame, teriyaki sauce that I literally could drink from a cup, it’s that good! 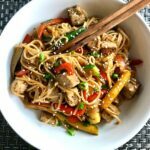 Then… the sweet red peppers, mild zucchini, slightly onion-y scallions, and of course, the teriyaki-seared tofu give so many flavors and textures. 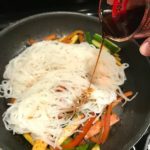 Finally the rice noodles that soak up the sauce and let you slurp up every last flavor make this dish complete and A-M-A-Z-I-N-G!! It all starts with the Tofu. 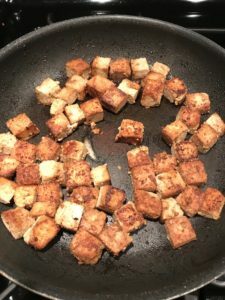 I really do love tofu when it is marinated in flavors and then seared to perfection. 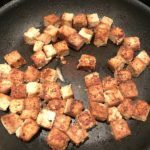 In this Ginger Teriyaki Tofu recipe, you will need Extra Firm Tofu. The firmer the tofu, the easier it is to sear and hold it’s shape. You want to soak it in teriyaki sauce 30 minutes to an hour ahead of time flipping the pieces as need so that every piece is coated. 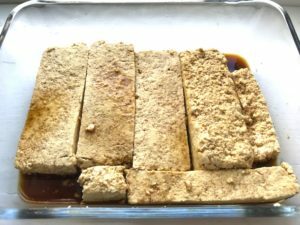 I start by slicing the tofu, then soaking the larger slices , then slicing again into rectangle pieces and pouring more teriyaki sauce over to coat each piece completely. Next prepare the veggies! 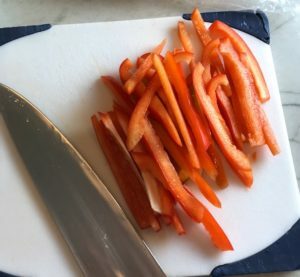 Slice the red pepper and zucchini into strips and then shop the scallions into 3/4 inch pieces leaving the tops of the greens to slice thin for garnish. Once everything is prepped, you will sear the tofu first. 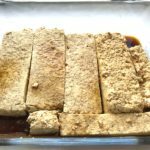 I absolutely love how the outside of the tofu forms this salty, slightly sweet teriyaki crust on the outside, but stays tender in the center. Because this is extra firm tofu, once seared, it will hold its shade and texture. 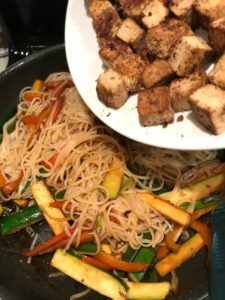 You remove the tofu and add in the veggies with the ginger and teriyaki. Add in the cooked rice noodles with the remaining sauce and toss. Then add in the tofu and lightly toss again. Plate and garnish with the sliced scallions and sesame seeds. 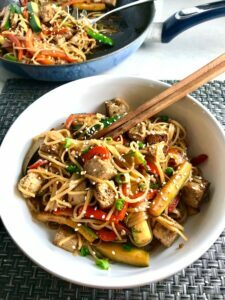 This Ginger Teriyaki Tofu Noodle recipe is A-M-A-Z-I-N-G. It has a ginger, sesame, teriyaki sauce that I literally could drink from a cup, it’s that good! 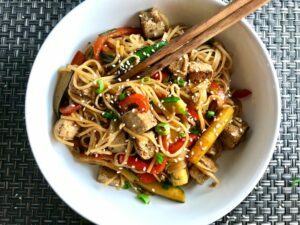 Then… the sweet red peppers, mild zucchini, slightly onion-y scallions, and of course, the teriyaki-seared tofu give so many flavors and textures. 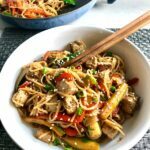 Finally the rice noodles that soak up the sauce and let you slurp up every last flavor make this dish complete and A-M-A-Z-I-N-G!! 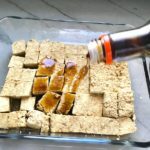 Cut tofu into 3/4 inch slices and pour teriyaki sauce over to coat. Marinate in fridge for 15-30 minutes. 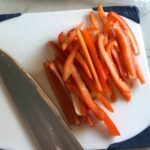 Next, cut the tofu into bite-size rectangle pieces. Sprinkle more teriyaki over to coast and let sit for another 15 minutes. 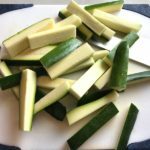 Slice Zucchini into thin strips about 1.5 inches long. 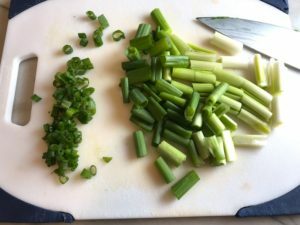 finely slide 1 tablespoon scallion greens, then rough chop remaining the scallions into 1/2 inch pieces. Peel and mince the Ginger. Add another teaspoon of Olive oil to the pan, then add Red pepper, scallion, ginger to the pan and sear for 2 minutes. Add another tablespoon of Teriyaki and stir. 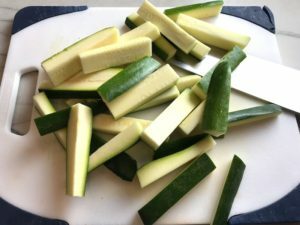 Add zucchini and cook for 1 minute. Turn off heat. Turn off heat on water and add noodles to the hot water. Stir to submerge and remove once soft, about 3-5 minutes. Drain and then rinse with warm water (rice noodles are very starchy and you need to rinse off the excess starch). 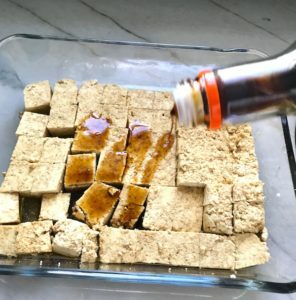 Mix together another 2 tablespoons of Teriyaki sauce, 2 tablespoons water, and 1/2 teaspoon sesame oil. Add the noodles, 1 tsp sesame seeds and sauce to the pan with the veggies and stir to combine. Turn the heat back on to warm through. Then add the tofu back and toss lightly so as not to break up the tofu. 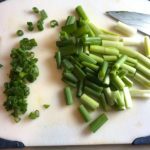 Serve and garnish with sliced scallions and sesame seeds. < Previous Meal Planning & Prep made easy! Hey there! 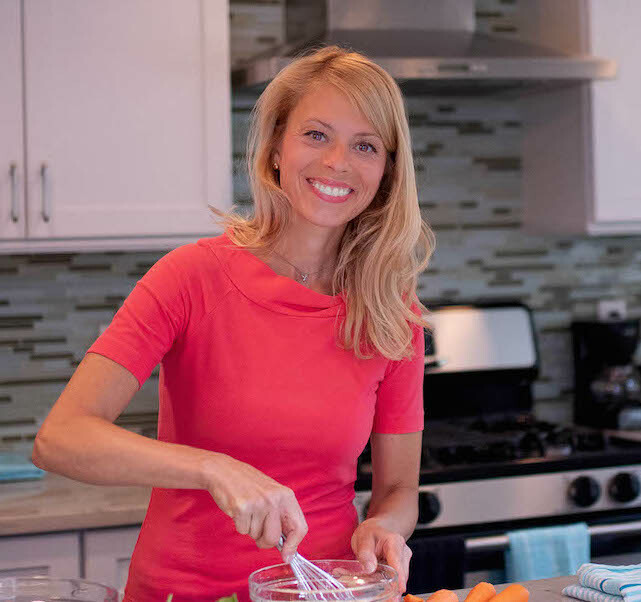 I’m Carrie – a food enthusiast, recipe developer, former caterer, & busy working mom. Click image to read more! Follow me on Instagram to get behind-the-scene stories and more food inspiration!! Sign up now to get Easy Dinner Recipes emailed to you! Sign up today to get your FREE e-cookbook with Top 5 Easy Dinner Recipes from Talking Meals! 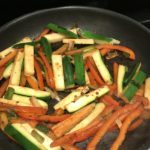 Sign Up to get Easy Dinner Recipes emailed each week! AND get 2 FREE Printables: Top 5 Easy Dinners & 10 Freezer Hacks! You can change your mind at any time by clicking the unsubscribe link in the footer of any email you receive from us, or by contacting us at carrie@talkingmeals.com. We will treat your information with respect. For more information about our privacy practices please visit our website. By clicking below, you agree that we may process your information in accordance with these terms.